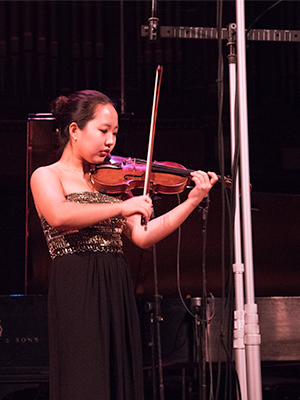 HyunJae Lim took 3rd Prize in the 2018 Menuhin Competition! HyunJae Lim most recently performed on Show 313 in Boston, MA, recorded on October 4, 2015. HyunJae Lim, also, appeared on Show 262, recorded in October 2012, at age 14, as a member of the Quartet Stracciatella. HyunJae Lim (violin), 17, is from Seoul, South Korea, and is a senior at John W. Hallahan Catholic Girls High School in Philadelphia. She studies with Shmuel Ashkenasi and Arnold Steinhardt at the Curtis Institute of Music. HyunJae has been a prizewinner in numerous competitions, including the 2016 Singapore International Violin Competition, the Great Mountains Music Festival concerto competition, the 2011 Luzerne Music Center Concerto Competition, and more. Participating in the 2011 Junior Division of the Fischoff National Chamber Music Competition led to her earlier appearance on NPR’s From the Top with Host Christopher O’Riley, Show 262 as part of Quartet Stracciatella. She plays on a 1719 Carlo Annibale Tononi on a generous loan from the Rin collection.